Options for bus communication, user programs, etc., are delivered ready for plug-and-play. The drive monitors how the system reacts on corrections made by the drive - and learns from it, so that precise and stable operation is achieved quickly. Standard feature that optimizes motor magnetization at all speeds and loads. Increases energy efficiency by 5–15% for partial loads. The VLT® HVAC Drive provides a complete range of energy consumption information, which helps identify low-efficiency components in the HVAC system. All standard PCBs conform with class 3C2 (IEC 60721-3-3). If used in especially harsh conditions, it is possible to order a special coating that complies with class 3C3. Special treatment that ensures components remain firmly in place in environments characterized by high degrees of vibration, such as marine and mobile equipment. 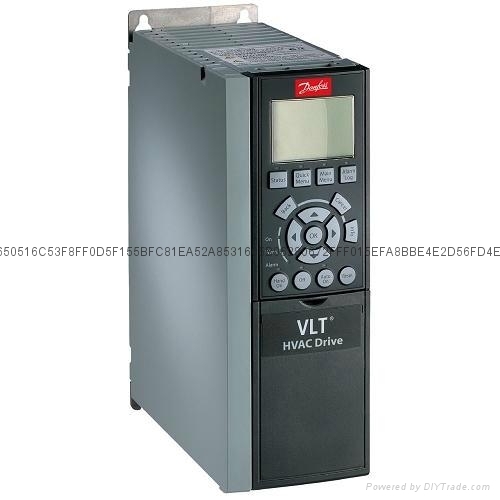 The VLT HVAC Drive can be remote commissioned and monitored through a USB connection. Safety feature that ensures fire escapes remain free of smoke by preventing the drive from reacting to control signals, warnings, or alarms. Instead, it continues reliable operation for as long as possible and runs until it eventually fails. From the relation between current and speed, the HVAC Drive is able to recognize a broken belt reliably. In the event of breaks or leakages, End of Curve triggers an alarm, shuts off the pump, or performs a user-defined action. The HVAC Drive constantly evaluates the condition of the pump, based on internal frequency/power measurements. Control up to three pumps with fixed lead pump. This built-in logic controls alternation between two pumps in duty/stand-by applications. Motion of the stand-by pump prevents the pump from. An internal timer ensures equal usage of the pumps. Reduces the pressure set point according to the flow - which saves energy.